In 1996 Europa Park was a green-field site some 45 km west of Warsaw in multiple ownership and without any construction permits. 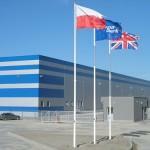 Woodsford helped create a new logistics development and investment company – Europa Distribution Center – that, in turn, put together an 80 hectare business park at the heart of the Polish and Central and Eastern European distribution network.EDC not only chose a location bisected by Poland’s two principal motorways but two major north-south and east-west railway routes. It built a 6-km rail connection to the national railway network.EDC developed three Class A distribution warehouses for international operators totaling 61,000 sqm and three further, similarly high specification, facilities totaling 94,000 sqm let. The last building developed under EDC's ownership was 60,000 sqm, – the equivalent of nine football pitches under a single roof. With Woodsford’s help, the income producing assets and remaining development land were sold in 2008 to Arcapita, the Bahrain-based investment bank. When fully built-out Europa Park will comprise around 20 buildings – 275,000 sqm of warehouse, light industrial and distribution facilities.